Finance Costs > How Much Does an Obituary in the Newspaper Cost? How Much Does an Obituary in the Newspaper Cost? An obituary, also known as a death notice or obituary notice, is a brief notice of someone’s death that is placed in a local newspaper. The obituary will usually include a small picture, a short biography, as well as other snippets such as who they left behind, when and where the funeral is going to be held, and other important information. The cost of an obituary is going to depend on the newspaper it’s publicized in, the amount of wording and how long it’s going to be publicized. On average, an obituary can run anywhere from $0 to as much as $600 depending on the features that will be placed in the ad. A smaller hometown newspaper may place the ad for free as a common courtesy. If the smaller newspaper does charge a fee, it will most likely be less than $50. Larger, metropolitan newspapers can charge anywhere from $55 to $220. Some newspapers may also charge per inch. For example, The Seattle Times charges $88 to $100 per inch. Major town newspapers such as San Francisco and New York City are going to charge a lot more than a metropolitan newspaper in Iowa. An obituary can either be written up by a family member or someone at the funeral home or newspaper can assist you. There are many examples of obituaries online that you can use to write one. Most newspapers will have links on their website where you can submit a death notice. If the newspaper does charge, at this time, you will submit your payment by credit card. While some newspaper companies manage its own obituary section, some publications do outsource their obituary services to third-party websites such as Legacy.com. Once the obituary is submitted, the newspaper will give a date on when it will be published. Generally, it will be published the next day. This should give sufficient enough time to alert family members and friends in the area about the funeral arrangements. Premium days such as a Sunday may yield a higher price tag. Generally, the weekdays are going to be cheaper than a Sunday. Pictures and longer biographies can cost more. Basic obituaries will only include a simple biography. For example, if you choose to add a picture, the price may rise. On average, most newspapers will charge $100 to $150 or more for a picture to be added. Some newspapers may charge an additional fee for an online or expedited listing. Newspapers can also include small card printouts that you can hand out to family and friends as well as to those at the funeral home. These newspapers can also create memorabilia such as the obituary in a special picture frame, etc. To have an obituary professionally written by someone else besides yourself or the funeral home, these copywriters can charge upwards of $100+ to create something that is truly memorable. Funeral homes will be more than happy to submit obituaries on your behalf. Some may do it as a courtesy as part of your funeral payment, while others may charge an additional fee to do so. If you haven’t written you obituary yet, refer to the newspaper guidelines as most have certain formats you need to follow in order to have it accepted. Also, keep in mind that most newspapers will edit your obit for spelling and grammar. It’s also important to know important deadline dates, the pricing policy and how long it will run. All newspapers will have its own rules. Consider keeping the obituary simple. It is ideal to use the funeral home to list the funeral date free of charge on their website. Also, consider smaller, hometown newspapers in the area rather than the larger ones. Ask the newspapers if they do obituaries for free. If they do, while it may be simple, it is still a way to get the word out free of charge. Obituaries are not completely necessary. Word of mouth will naturally spread among people the deceased knew. Out of state Funeral Home [Maryland] wants to charge $400 for each newspaper they put the obituary in, which was going to cost $800 for 2 local newspapers in Virginia. 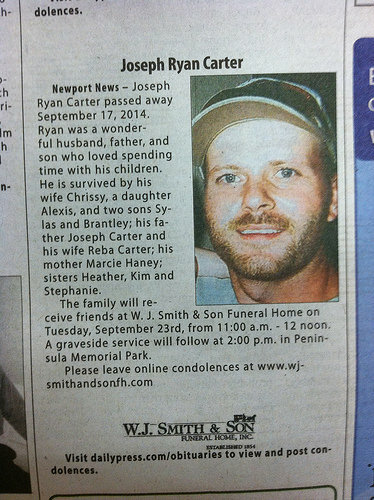 The obituary was already placed in the newspaper in the state where the deceased lived. I was just asking to have them submit the same obituary to the 2 local newspapers; no additional information was requested from them. Don’t understand this exorbitant fee for information they already have. Nothing was said about costs anywhere,any time until after publishing, just a verbal “we’ll take care of it”. They made changes that turned the obit into something that sounded like it was written by an unmotivated 12 year old without submitting it to me for approval and published it without my consent. After I demanded a reprint using my original text, both obits appeared on line side by side. These people are dishonest and/or completely incompetent. Get the cost in writing first! These people are evil and they well understand the psychology of the bereaved and take FULL ADVANTAGE. They also ignore using time and cost saving programs such as “Save as Word Document” to run up the word count in order to pad their bill to the customer. Yes, it’s true. It was the San Diego Union Tribune (owned by the LA Times) and the only way I could post for a day in the newspaper was to “buy the package” with a bunch of online stuff I did not want. I am outraged that they take advantage of grieving loved ones who want to honor their departed. The Hartford Courant 10/23/16 – $907.67 !!!! I did the entire listing and wording myself thru their online portal. For (1) small picture, a cross emblem and approximately 100 double sized lines across size. In the Sunday paper and online thru legacy.com which is standard for the obituary department. I had to pay this because it is my Dad but you can’t find the price of what you are doing until the very end and then it does not give you a breakdown of where the money is being spent so you can adjust the pricing! They got ya’. Seems very predatory… ours was submitted through the funeral home and billed directly to our credit card. while it is not really “optional” … we have immediately cancelled our subscription after 45 years, as that is unacceptable.